2 Lay two 24-inch-long sheets of foil on a work surface, overlapping one about halfway over the other to make one long, wide sheet. Lightly coat with cooking spray. 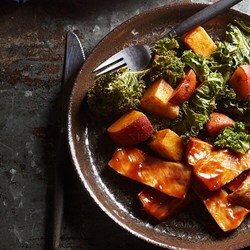 Toss potatoes and kale with 1 tablespoon oil, chili powder, paprika, ¼ teaspoon salt and garlic powder in a large bowl. Mound the vegetables in the center of the foil. Wrap up the foil into a packet and place on a baking sheet. Roast until the potatoes are tender, about 25 minutes. 3 Meanwhile, heat the remaining 1 tablespoon oil in a large skillet over medium-high heat. Sprinkle pork with the remaining ¼ teaspoon salt and cook, turning once, until an instant-read thermometer inserted into the center registers 145°F, 6 to 10 minutes. Transfer to a clean cutting board and cut crosswise into slices. 4 Mix barbecue sauce and water in the pan and add the pork, turning to coat with the sauce. Serve the kale and potatoes with the pork, drizzled with any sauce remaining in the pan.